Nice shots, Ray, good looking dogs. I would describe these as typical Thailand dogs...smallish, generally docile, except when defending their house-yard territory...used only as pets or, occasionally, food. I love that! Cats and horses regularly groom each other (as do primates of course) - but I never think of dogs doing the same thing! How wonderful - and you've gotten great shots of this! Ray: Dogs seem to do it even more than cats, Elizabeth, and it is interesting to see it is not strictly related to "pecking order" behaviour. Ray: I am more into grooming others, and allowing others to do it to me, since coming to Thailand, Peter...it is a very common behaviour in this country. We have a lot to learn from our 4-legged friends, Ray, I'm sure! Ray: Certainly dogs and other animals are better at mutual grooming than are humans, Ginnie. Y' can't beat a bit o' mutual groomidge - eh! They look like good, true, useful fellows! Ray: They are useful to each other, Philine, but the only thing they do for me is wake me several times each night with barking, baying and battling sessions...they are neighbours' dogs. Ray: Indeed...key behaviour for peaceful co-existence, Lisl. Ray: Hairy, four-legged animals, are they, Bill? All working together. Blackie looks to be slightly embarrassed by such actions. Ray: Blackie might be somewhat bemused as he is at least two steps down the pecking ladder from Brown. Ray: Sounds like a winning tactic, Richard. Just look at those fangs Ray. Ray: Dogs are well equipped in that department, Chad. A few bits of extra food for payment. You never know. Perhaps fleas are delicious. Ray: I think this is all about "scratch mine and I'll scratch yours", Mary...fleas might be a bonus. Ray: I am not really a dog person, Tom, but am beginning to respect them for their interesting behaviours. 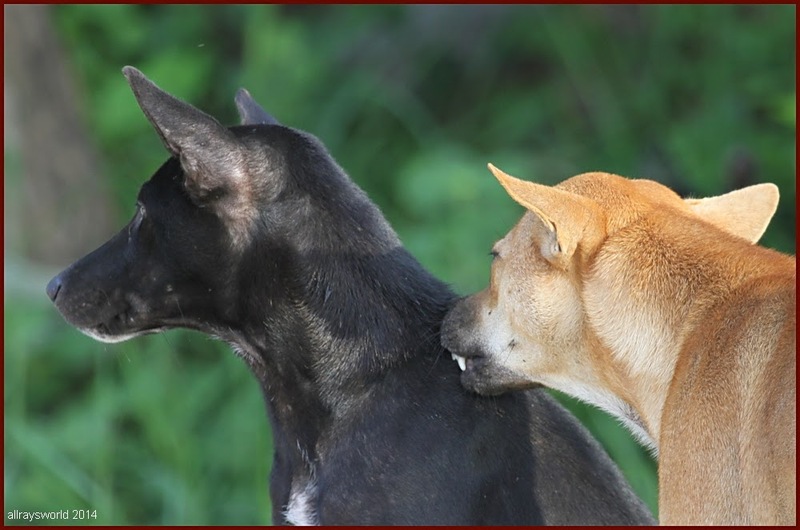 great couple of shots Ray, i knew that stray dogs tend to stay in a pack but never observed this grooming practice. Ray: I have only been interested in dogs a short time, Ayush, but am beginning to see quite complex behaviours that are clearly designed to make a group harmonious.